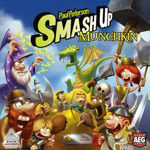 Last year we announced that Alderac Entertainment Group was working on a Munchkin version of their Smash Up "shufflebuilding" game, and over the last year Steve, Andrew, and John have been working closely with the AEG staff to assemble the finished game. Good news, everyone! The Smash Up Munchkin game is at print and if things go right (knock on wood!) AEG will release the game at GenCon next month. Hurray!!! The finished game looks incredible, with John's art and AEG's team blending and mixing styles to create images that clearly project the Munchkin silliness through the Smash Up visual lens. And you can see samples of the artwork, as well as get a peek at some of the gameplay elements, in this preview at the AEG website. I can't wait to see how Smash Up Munchkin blends with AEG's Pretty Pretty Smash Up expansion.